Last Halloween, my husband opened our closet door and reached for the topmost shelf where he keeps his Zipperhead mask. He ignored me as he is often wont to do and pulled it on over his face. My husband had worn this mask all through the 90s and now, in 2015, looked forward to going out in public in it that very evening. The rubbery skin covered my husband’s face. 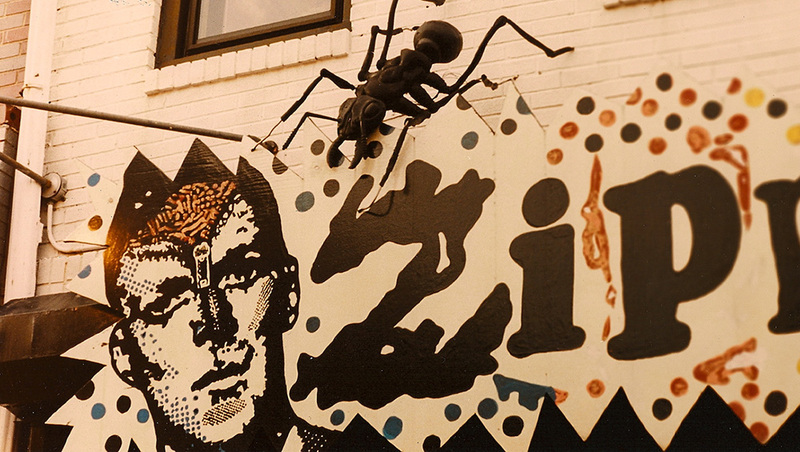 A half-opened zipper to match the one painted on the store’s façade next to the gigantic metal ants, stitched through the mask’s forehead and nested in the mask’s crown of red, kidney-shaped brains. He opened a flap and beneath it found two switches. He flicked them on and the exposed brain particle lit up with tiny dancing lights. My husband also dug out his black Dr. Martens and a Zipperhead T-shirt. Punk is long dead. My husband sold Zipperhead in 2000 to Rob and Steph, his two top employees who were married to each other. They ran it as Zipperhead for several years, then relocated it around the corner in a smaller space, and renamed it with a touch of levity Crash Bang Boom. Harriet Levin Millan‘s debut novel, How Fast Can You Run, based on the life of “Lost Boy” of Sudan Michael Majok Kuch has been selected as a Charter for Compassion Global Read. She’s the author of two books of poetry, and a third to appear in 2018. Among her prizes are the Barnard New Women Poets Prize and the Poetry Society of America’s Alice Fay di Castagnola Award. She holds an MFA from the University of Iowa and directs the Certificate Program in Writing and Publishing at Drexel University. Click here for more essays on The Smart Set.